The path to world recognition has not proven to be an easy trail for the Baha'i Faith. There have been moments of glory. 'Abdu'l-Baha, or Abbas Effendi, attracted a good deal of press interest as he travelled through Europe and America. The Baha'i "House of Worship" in Wilmette, Illinois is one of the Chicago area's more recognized monuments, and the the buildings in Haifa, Israel and New Delhi, India uphold this architectural tradition. Still, these edifices are few and far between when compared with other young religions such as the Mormons, who have built 129 temples, some of them very impressive, and over 16,000 churches worldwide. 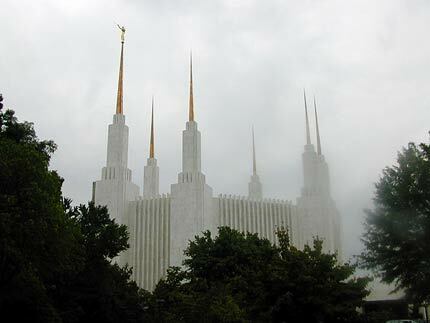 Mormon temple in Washington, DC. © 1999, Dave Caron. All rights reserved. In the 1970s, the pop music duos "Seals and Croft" and "England Dan (Seals) and John Fordcoley" brought recognition to the Baha'i Faith. In the late 1970's, the Iranian Islamic Revolution was seen by Bahá'ís as an opportunity for their religion to finally "emerge from obscurity", as the Bahá'í leadership has, in the Shi'ah tradition, ever looked to martyrdom as a demonstration of the faithfulness and solidaridity of their following. The Bahá'í leadership today claims a membership of seven million believers (see adherents.com for comparisons with other faiths), but there is little real evidence of growth since the 1970s. The 1970s brought hope that Bahá'ís would finally be recognized for their accomplishments as individuals, but little has shone from Bahá'í artists, scientists, etc..., since then. The Jazz great Dizzie Gillespie became a Baha'i late in life, but his great accomplishments could certainly not stand as evidence of any traceable Baha'i inspiration. The Bahá'í scholar Dr. Juan Cole has gained recognition as an expert on Middle East affairs during the War in Iraq (2003–4), though he left the Bahá'í Faith in 1996 and has repeatedly renounced fundamentalist leanings in the Bahá'í administration. The leadership of the Bahá'í Faith finally published their officially sanctioned translation of the Kitáb-i-Aqdas in 1993, thus bringing to the surface for all time the conservative Islamic foundations of the religion. Soon thereafter, the Internet appeared, giving Bahá'ís unprecedented access to the thoughts of other Bahá'ís worldwide, causing well-publicized rifts among the believers as Bahá'ís began to discuss issues in this new worldwide forum.